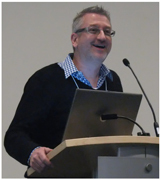 Last evening we had the pleasure of attending Annex Pro’s  Expo 2011 at the Vancouver Convention Centre, where we had a chance to catch up with a few friends as well as make new ones. 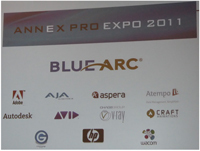 The team at Annex Pro put together a great group of vendor booths – it’s a good thing that the CaveChild was not with us, or he would’ve tried to make off with the entire Avid Pro Tools  display. As it was, I spent a fair bit of time talking with Bonnie from Wacom , and with a smoking hot sales deal from Annex Pro, my very dated Wacom Graphire 3 is now a medium-sized Intuos 4 . Now I am just waiting on my registration emails from Wacom (how long does that take, anyway?) so that I can install the free software tools that purchasers of Wacom tablets receive, and then I can watch my Adobe PhotoShop Elements  4 upgrade to version 8 (oh wow, just learned that Adobe is now on version 9), and maybe in a few months’ time I can take advantage of the Wacom Buyer Privileges  and upgrade my PhotoShop 7 to PhotoShop CS5 with the special purchase deal. Oh, and if you think my PhotoShop is outdated….I still use Bryce 5 and PaintShop Pro 8. I won a copy of Corel’s PaintIt  on Twitter a few months ago, and have been playing a bit with it – watching the software’s conversion process is quite entertaining. Scott’s interest at the Annex Pro event was tweaked both by the keynote delivered by Technicolor Creative Services’ Tom Burns and by the offerings from Atempo , Aspera , Blue Arc , G-Tech , AJA  and HP  because he likes to geek out over the technical side of things, which are completely out of my realm. As long as our networks connect and the computers and server are working, I’m happy – although I do want the fancy computers & screens they have on CSI and Bones, just because they look cool. I have always liked the software tools developed by Autodesk , who was also present at the expo, but as I can’t draw and haven’t even mastered Bryce 5, Maya and Max are far beyond my capabilities – I have a healthy respect for anyone who creates product with that software. Craft Animations  was also displaying their wares, and I actually have one of their products, which I won at a previous Annex Pro event. Not a clue what to do with that, either. Perhaps we should come up with a contest and offer it as a prize; I’m sure there are some indie devs out there who would benefit greatly from having it . Transgaming Studios  has released the pre-game cinematic for their upcoming title Garage Inc  on the game’s Facebook page . The cinematic introduces the player to the characters and sets the mood for this 1920’s Prohibition-era game. Watch as lead character Angelo talks with his cousin Sal during a family Christmas gathering about the garage he dreams of opening. There are two new indie titles available today – Xona Games  is burning up the dev pipe, releasing their second new title this week. Score Rush  has passed Peer Review and is now out on Xbox Live Indie Games for 80 MS Points. Built on the Duality ZF engine, this 4-player shoot ’em up features overwhelming firepower, trailing options, full screen bombs, tons of enemies, an intimidating final boss and hundreds of crazy bullet patterns to survive. The 60 fps adrenaline-rush experience is complemented by a hard-rocking Dragon Music soundtrack. Also out today is RatRod Studio’s  Drift Mania Canadian Championship  is now available in the Android Marketplace  for 99 cents. Previously released in the iTunes App Store , Android users can now get in on the racing action. Drift Mania Canadian Championships features Online Global Leaderboards with live events, variable throttle system and hydraulic handbrake with adjustable steering sensitivity, 7 uniquely spec’d vehicles, 5 different tracks, 2 acceleration modes and 3 levels of difficulty with 3 camera configurations. If you want to relive the moment, there is a highlights replay system, and you can also listen to either the included soundtrack or your own music as you tear up the track. A post made earlier today by Frima Studios ‘ Executive Producer Martin Brouard on the official PlayStation blog  announced that there will be a new title released by the studio on December 21st. 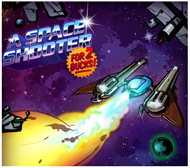 A Space Shooter for Two Bucks will be available for free to all PlayStation Plus subscribers, and $1.99 for everyone else. According to the blog, A Space Shooter is of the classic arcade space shooting genre (in case you couldn’t guess that from the title), and “swarms of enemies filling the screens with hazardous bullets and missiles, heaps of upgrades for your ship and its arsenal, high-paced and constant action requiring deft reflexes, and hordes of alien baddies just waiting to be blown up by your superior space-faring skills.” Plus, to add to your gaming experience, there will be a myriad of interesting characters to encounter and in some cases control. Kitchener-Waterloo developer Footloose Games  has announced that they will be releasing a beta version of their Munchies’ Lunch title on December 27th. Munchies’ Lunch is a fun adventure-puzzle PC-based game for the whole family. Simply download the game from the Footloose website to embark on an epic journey with the Munchie family as they say goodbye to their homeland and travel the world to find a peaceful place where they can settle down. Mr. & Mrs. Munchie will travel along with their children through far-away jungles, over steep mountains, and across the hot deserts in their journey. Along the way they’ll meet the ravenous Hungries, crafty bird-snakes and perhaps ev en a tribal tiki or two. Vancouver developer LoudCrow  has released its latest iPad book. 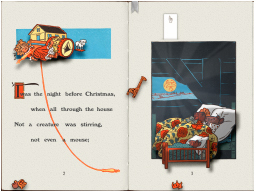 Available now, this pop-out version of The Night Before Christmas  joins LoudCrow’s previous title, Pop-out Tales of Peter Rabbit  in the iTunes store . In this new release, you can see William Denslow’s masterful illustrations brought to life with innovative pull-tabs, spin-wheels, and elements that bounce and spring with the touch a finger. Listen to “O Christmas Tree” beautifully performed on piano while you read and interact with each page of the book. Explore every scene and discover the many delightful life-like interactions at your fingertips. Kobo  has launched Reading Life, an industry first social eReading experience. Readers can now track their personal reading history, check-in with characters and places inside books and earn achievements and awards for simply reading. Readers can also choose to share books, favourite passages, awards and more with their friends on Facebook. Kobo Reading Life is initially available on iPad , as a part of the latest iPad update in the iTunes store now. Sharing Books and Passages: Users can tell their friends what they are reading or highlight favourite passages in books they are reading. This is a great way to get a book club started, or update your bookclub friends as you read. Statistics: Users can track their reading life with interesting statistics, including how many books they’ve read, pages turned, how fast they read, and times of day they read. Statistics help users track their progress, earn awards, as well as discover and learn about their own reading styles and preferences. Activity: An activity panel shows the timeline of a user’s reading life, highlighting important events and milestones. Users have an at-a-glance view of their reading life, including new books opened, read and finished, passages shared, awards earned and more. Check-Ins: Another ground-breaking feature called Check-Ins, enables readers to check-in with characters and locations inside books, enabling them to mark important milestones and win awards. For example, readers reading Alice in Wonderland can check in with or meet Alice for the first time, or check-in to the Rabbit Hole and tell their friends on Facebook. Awards and Rewards: Readers can unlock fun and surprising awards that celebrate achievements in their reading life. Awards like ‘The Papillion’ which is earned by the power social sharers, ‘The Twain’ earned by those that read daily, and ‘The Witching Hour’ for readers who read into the wee hours of the night – once an achievement has been earned the reader can than publish and share with friends on Facebook. Award winners can also be rewarded with special offers from Kobo or its partners, just by reading! Personal Book Cover: As your personal Reading Life evolves Kobo creates and automatically updates your own personal book cover – a mosaic of your reading life that you can easily share with your friends on Facebook.